This is a continuation of my previous blog post outlining the descendants of my paternal grandmother – Mary Murdock Miller – tracing her 5 children who in turn had 10 children, making a total of 10 grandchildren for Mary Murdock Miller. Her eldest child Myrtle had 3 children , her son Joseph had 4 children, and her youngest child Roy had 3 children. My grandmother’s life straddled the 19th and 20th centuries. She was born in 1863 in Crown Point New York, upstate New York near the shores of Lake Champlain Vermont. Born at the turning point of the American Civil War, she experienced 3 more very significant wars in her lifetime – the short lived Spanish American War when William McKinley was President, U.S. involvement in World War One when Woodrow Wilson was President, and the much greater involvement in World War Two under President Roosevelt. She died in 1954. When she was born, Abraham Lincoln was in the Oval Office. Lincoln was followed by Andrew Johnson ho was President from 1865-1869. In 1869 Grandma would have been 6 years old, just hazily aware of who was President and the significance of that position. President Andrew Johnson was followed by Ulysses. S. Grant, Rutherford B. Hayes (whose wife Lucy was the first First Lady to graduate from college), James A. Garfield, Chester A. Arthur, Grover Cleveland, Benjamin Harrison, Grover Cleveland again, William McKinley, Theodore Roosevelt, William Howard Taft, Woodrow Wilson, and Warren G. Harding. 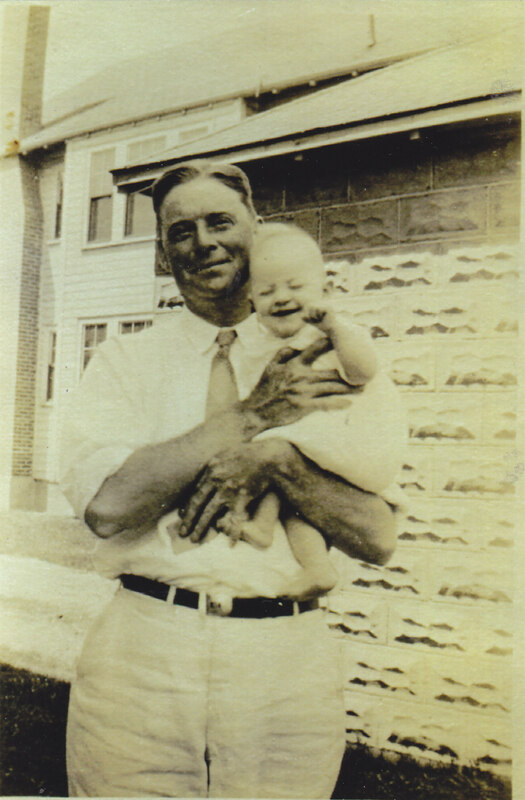 Harding and my grandmother were approximately the same age. Following Warren G. Harding, we have Calvin Coolidge, Herbert C. Hoover, Franklin D. Roosevelt, Harry S. Truman, and finally Dwight D. Eisenhower. It seems like ancient history merging into the modern era. In a way, my grandmother’s personal history goes even further back in time than her lifespan. She can claim to go back almost another 30 years to 1836, the year her husband was born. Identifying my grandmother by her children and grandchildren – her daughter Myrtle had 3 children – William, Mary and Nancy; her son Joseph had 4 children – Bob, Ruth, Nancy, Janet; and her son Roy had 3 children – Muriel, Roy, and Jeanne. How long has it been since I last posted to this blog? Where have I been? What have I been doing? I’ll try to fill in the gap, but in the meantime I’ll start with a book I just finished reading. 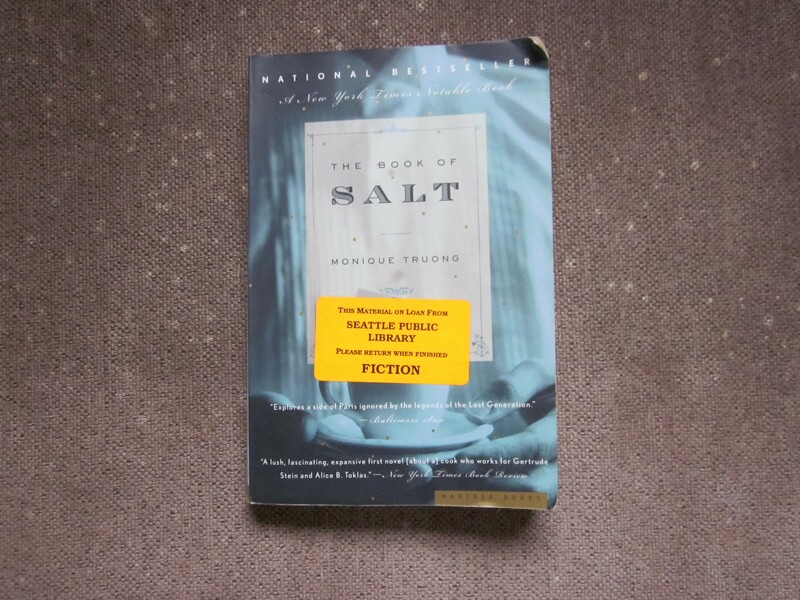 The Book of Salt by Monique Truong, published in 2003. . The author, Monique Truong, was born in Saigon but moved to the U.S. when she was six. I enjoyed the book for its snippets of Gertrude Stein and Alice B. Toklas and Paris in the early 1930’s. It is written from the eyes of their Vietnamese cook. The “secrets” of Gertrude Stein and Alice B. Toklas are interwoven with the life of their cook who was born in Vietnam and lived and worked there until his early 20’s. He left to see the world and ended up in Paris, just at the right moment to answer a help wanted ad by 2 American ladies for a live-in cook. He is unfazed by their eccentricities – and indeed has a few of his own. In view of the upcoming Royal Wedding, this proved to be an especially fascinating read. The current King of Norway is 2 months younger than I am. This is a true life journal of the first year and a half of his life, as told by his Nanny. He was born in 1937. These were tumultuous years in Europe as King Edward VIII abdicated in December 1936 (the year I was born), Hitler increased his power and plans for conquest, and surprisingly invaded Norway on April 9, 1940. The Nanny’s journal covers intensely the first year and a half of the young Prince’s life. 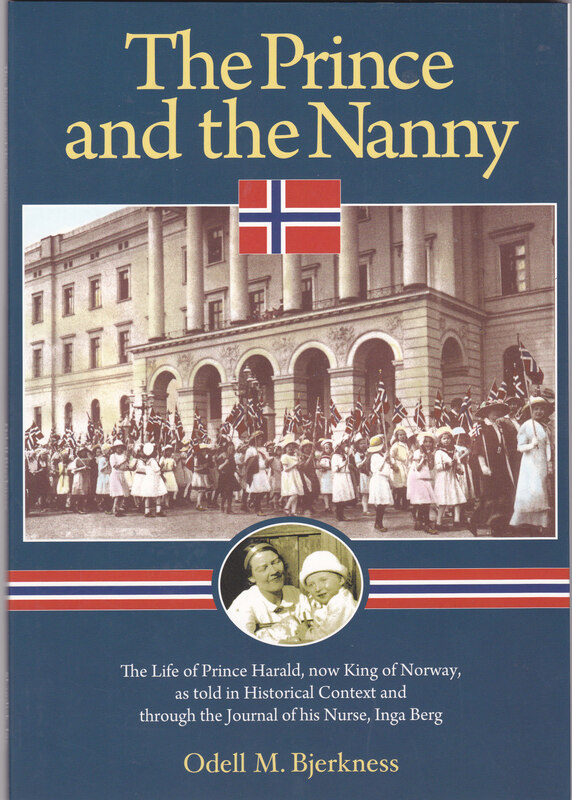 When Norway was invaded, the Nanny had previously finished her year and a half as his pediatric nurse. But in the book she describes the departure of the Royal Family and the flight from the Nazi invaders. The young Prince and his mum and sisters eventually reached the U.S., via Sweden and Finland, to spend the rest of the War Years. The Norwegian Government, headed by the young Prince’s grandfather the King, escaped from northern Norway to Britain and spent the War Years in exile in London. It is fascinating reading. The young Prince was/is my contemporary, his parents contemporary with my parents, and his grandparents contemporary with my grandparents. So far as I know, my mother did not keep a journal of my daily progress during my early months, but I do know that I was well wrapped up and put out in the fresh air very early on, just like the young Prince. And as to what he was fed, I will compare the Nanny’s record with that of my grandmother a generation previous. I blogged about this a while ago so I will look it up and come back with that comparison. Another parallel is that the young Prince married in 1968, the same year Ian and I were married. I wonder if he and his wife followed Dr. Spock as Ian and I did with our infants. In 1991, at the age of 54 Young Harald ascended the throne. Now as the reigning monarch among the last of European royalty, I assume the Prince, now King and his Queen have been invited to the upcoming Royal Wedding of Prince William and Kate, a commoner, like the Queen of Norway. 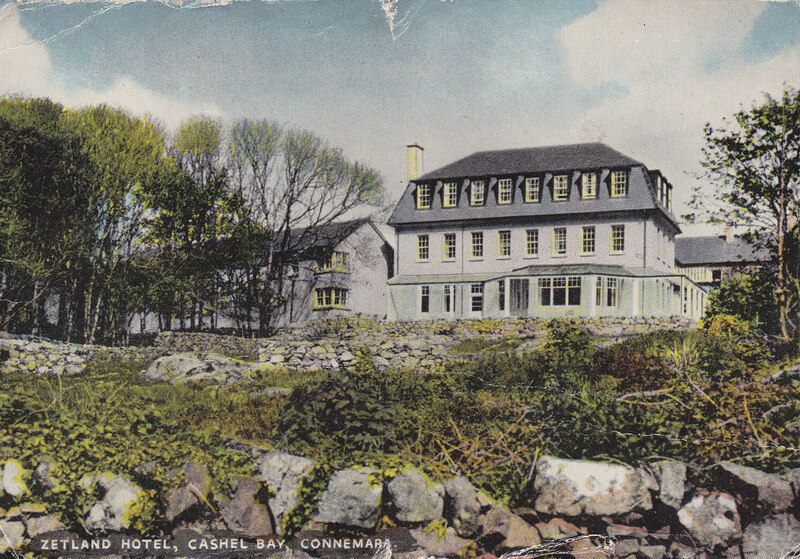 In sorting through some of my postcards this morning, I came across this one of the Zetland Hotel, overlooking Cashel Bay in Connemara, Ireland. The Zetland Hotel is where relatively new husband Ian and I spent a lovely weekend in December 1968, only a few months after we had moved there from Kenya. It was such a treat to find this hotel. We had a very spacious room, reminiscent of the rooms in the old hotels in Kenya, particularly the Outspan Hotel in Nyeri, where we spent part of our honeymoon. Since our honeymoon incorporated Valentine’s Day 1968, in a convoluted way that makes this a good card to post on Valentine’s Day – yes it’s still Valentine’s Day here in Seattle, even though it’s almost over in Ireland, 8 hours ahead of us. The Zetland Hotel is still there in Cashel Connemara. A very popular spot. What struck me then in 1968 when I was a newcomer to Ireland, were the lovely peat fires and the friendliness and casualness of the hospitality. And I particularly remember the open door to the office and the huge pile of money just sitting there on the desk. I could hardly believe it, particularly coming from Kenya, or anywhere, where such a trusting situation would not have occurred. The other memory from that hotel was the bright full moon, a clear crisp night, and daylight not until about 10 a.m. This was December and my birthday weekend so I have a few anchors there to pinpoint the Zetland in my memory. A few years later French President De Gaulle came to Ireland and he too stayed at the Zetland. I wonder if he had that nice front room that we had occupied. 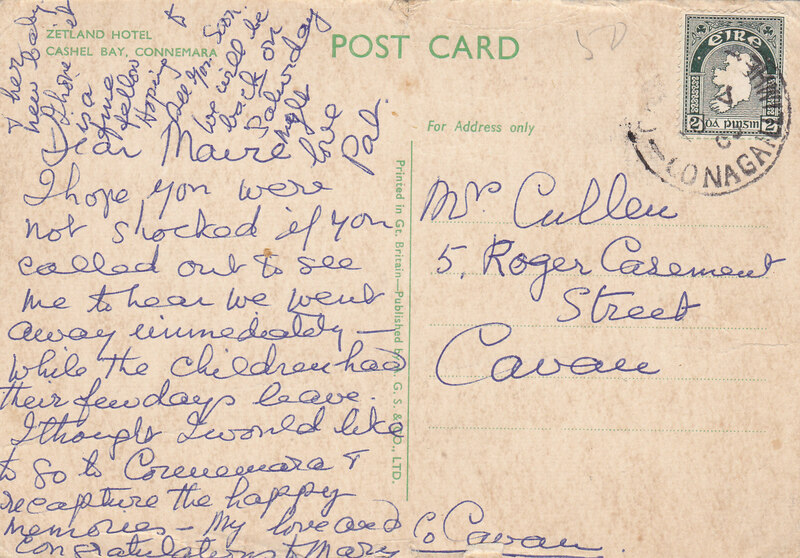 A bit of postal history also from that card. I like the address to which it was sent. Roger Casement Street in Cavan. I can’t make out the postmark. Maybe my friend Maire can help me here. It looks like CONAGA…..I can’t make out the rest. The website showing the Irish names for places in that part of Connemara doesn’t have anything resembling that. But the stamp – the green 2 penny stamp – the first stamp issued by the new independent country the Irish Free State, 1922. Note that the stamp shows the entire island of Ireland. The North of Ireland was not officially recognized as being a separate entity. A lot of history lies behind the design of that stamp! A history I might add that is very complicated and I still have much to learn in trying to understand it.